Manipal: Having criss-crossed India quite a bit on his bicycle, S.S. Shameem, an assistant professor in the Department of Computer Applications in Manipal Institute of Technology, MAHE, currently posted in Manipal International University, MIU, Malaysia pedalled 2,200 kilometers in 15 days, between January 31 and February 14, 2018, to raise Rs three lakhs to support Rotary’s Global EndPolio Mission. He traversed the length and breadth of Malaysia to complete the Operation Polio Eradication (OPEM) initiative by MAHE and Manipal Global. 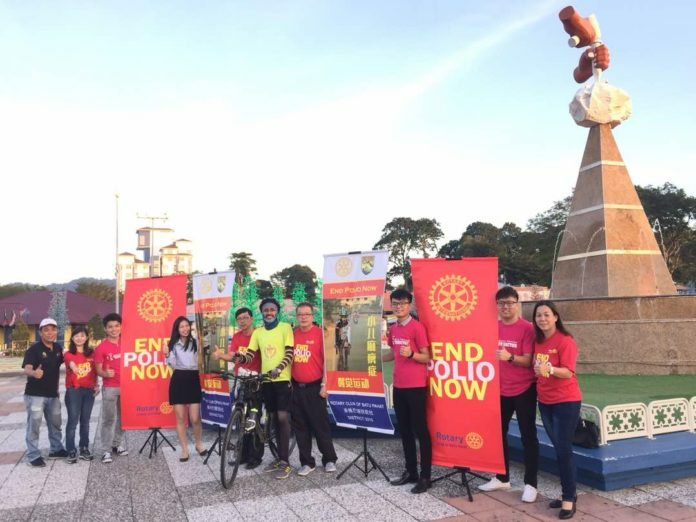 In the process, he also spread awareness on ‘EndPolio’, which is Rotary International’s global mission, and helped to promote MIU’s ‘Green-Health Awareness Agenda’, an initiative aimed at projecting cycling as an environment-friendly and healthy mode of daily transportation. Shameem covered nearly 150 kilometres every day on an average. The faculty and staff of MIT, Manipal are elated about the remarkable accomplishment. MIU and Rotary are in talks with the Malaysia Book of Records to register this event, thus bringing global recognition to the Manipal branding. This is one of the several unique, major achievements by a Manipal Group alumni staff.